Saturday- We woke up to 41 degrees. Bob had to start the generator at six AM, as the batteries were down. It turned out that the printer, for some unknown reason, had decided to fax all night. Not sure why it did that, but it is now disconnected! This is the first day of the rally. We are expecting six more rigs, but we are also expecting that some people will arrive without reservations. We left early and went across to La Posa West and drove to the back of the area, towards the big white tent. We parked, then hiked crossed the ravine. We must be in a different place than where crossed two years ago, because it was very steep. I had to be really careful when walking through because of my ankle. I also did not want to fall on my new knees! We walked across the parking lot where the vendors park, and into the Big White Tent. It was already mobbed! We have a list of items to purchase, so we started looking for what we want. While Bob was paying and setting up, I continued on and ended up outside at a table calling Silly Al’s to order the pizzas for tonight’s dinner. I ordered 7 “Goliath” pizzas. They were supposed to feed 40 people. Bob caught up with me and we continued on. We finished the north inside isle, and started down the north side outside. As we were walking by a Thousand Trails booth, I saw a big sign outside, so I stopped and looked. They had a special for Sunshine Key in the Encore section. Hmmmm, so I asked the gal about it. She said they were taking reservations. She said go inside to the Encore booth and tell them Linda sent us. The big deal with this is that we can only make reservations 90 days in advance through Encore and we know that we would not be able to get a reservation that late. It is very difficult to obtain reservations in Florida. So we maneuvered through the crowd again and I found Alysha,one of the workers. I explained that we wanted to make a reservation for Sunshine Key. We talked and she tried to make the reservation. The reservation would be for a month, at a whole lot less than if we paid for just a few days. So we asked her to make the reservation. She could not get through ,so we need to follow up. We continued on our way, stopping to pick up lunch at a concession. Then we had to climb back through the ravine to the car. We left and went to pick up the doughnuts for the morning, as the bakery is closed on Sundays. We returned to the MH and Joe( the window repair guy) was there talking to Susan, so Bob took him in to show him the window we need repaired. He is ordering the part. Meanwhile Bob’s phone rang and it was the installer for the satellite. So we quickly ate our sandwiches, Bob walked the dogs and I ran out to the gate to lead the installer out to the MH. He installed the satellite in 1.5 hours. We just stayed out of his way. I went and talked to MaryAnne, returned and made my list of topics to discuss this evening at the campfire. Then we sat outside in the sun. MaryAnne was just sitting as she still is not feeling well, but she was collecting the money from folks as they arrived. The weather was perfect. Not a cloud in the sky. Bright sun. We were all just in shirts, having lost our sweatshirts along the way. It was nice and warm, in the high 60’s! We had asked for people to bring tables and so tables, with table cloths, were showing up. We set them up and put the table cloth holders on, so that the cloths would not fly away. Bob and I left at 4:50 to go to pick up the pizzas. Wow, Silly Al’s was mobbed. I dropped Bob off and he went inside to pay and get the pizza. I sat in the car, blocking people who were parked, as there was absolutely nowhere to park. Bob returned carrying three pizzas and one of the employees was carrying four. We loaded them into the back of the Edge and drove back to the campsite. We set them on the table and rang the dinner bell! People started arriving. Leigh and Susan had made a salad, so everyone dug in. All of the pizza went, and I wished we had bought one more. Everyone was raving about how good the pizzas were. I stood up and made the announcements; there was some discussion, then some folks left to go watch the Arizona game. We sat out until after 8, then came in as we were getting cold. Sunday- Here is a picture of our sunrise. A little blurry, but you can see the colors! We put out the doughnuts and of course everyone showed up for their breakfast and to chat. 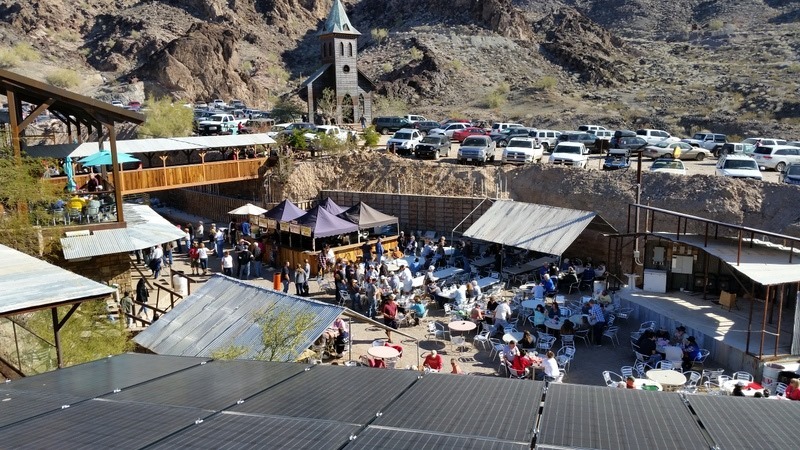 At 11, we lead the convoy to the Desert Bar. We had been there before, two years ago and really enjoyed the experience. We arrived, parked and it was already very busy at 12:35. We went down to the bottom level, and got in line for lunch. We all ate, then wandered around. They did not have very good shirts this time, so I did not buy one. I get a kick out of this place. Everyone is a senior, and they are partying! 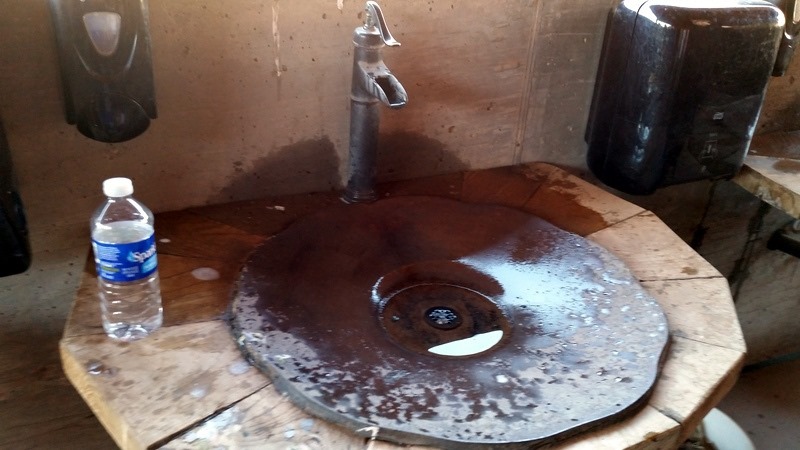 Below is the ladies bathroom sink. I think it is unique with the water pump. .
We left at around 2 to return home. We stopped in Parker at the Walmart to pick up some toner for our printer as it had run out of black ink. We both thought we had more black. We arrived back in time for the afternoon social. We ate dinner and enjoyed the evening campfire. Monday- Again we led the convoy to the Blythe Intaglios. We started with seven cars and ended up with 10! It was a 35 mile drive but the road out was not really bumpy for very far this time. John and Deb Brewer rode with us. We were just meeting them for the first time. They have an Alfa MH, but do not have a tow car. I just can’t imagine not having the car to use when traveling, but each to their own. Taken from the BLM website. 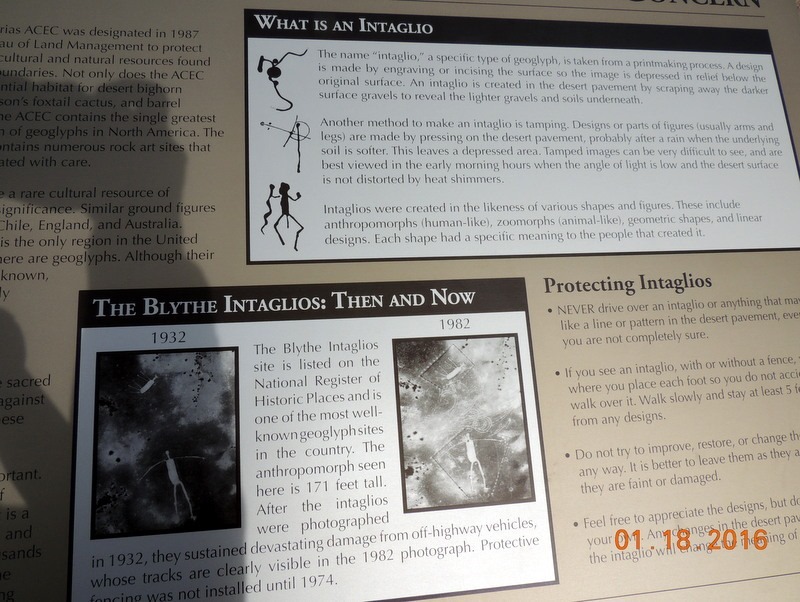 The name ‘intaglio’, a specific type of geoglyph, is taken from a printmaking process. 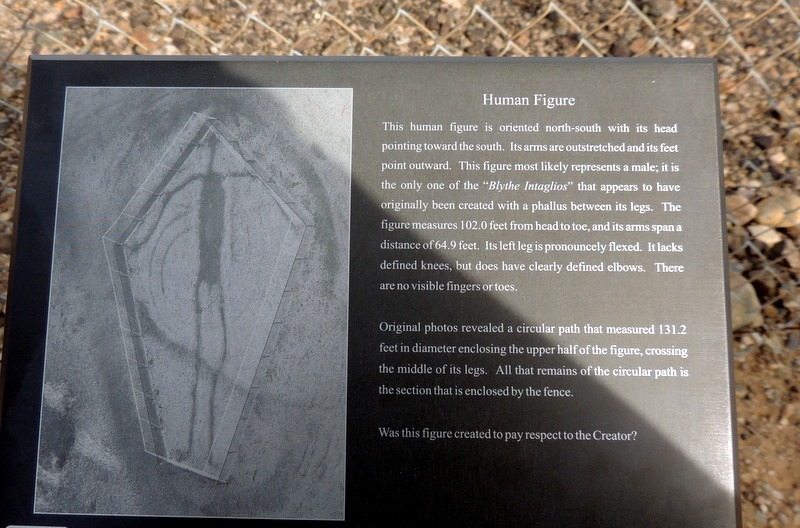 A design is made by engraving or incising the surface so the image is depressed in relief below the original surface. 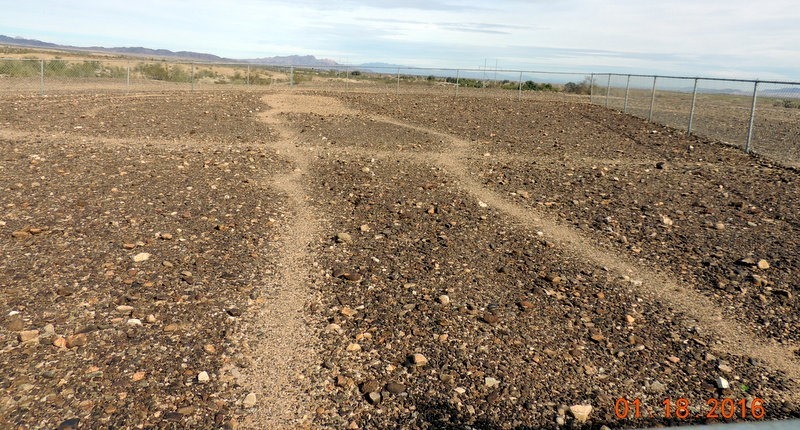 An intaglios is created in the desert pavement by scraping away the darker surface gravels to reveal the lighter gravels and soils underneath. Another method to make an intaglio is tamping. 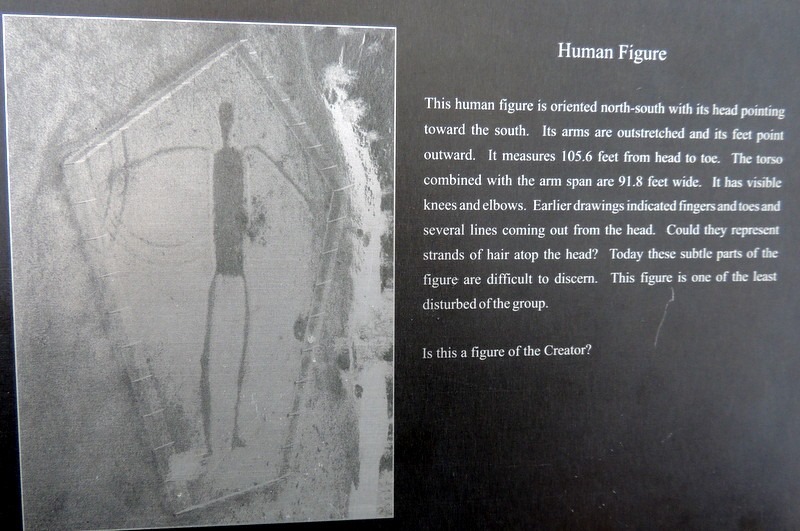 Designs or parts of figures are made by pressing on the desert pavement, probably after a rain, when the underlying soil is softer. This leaves a depressed area. 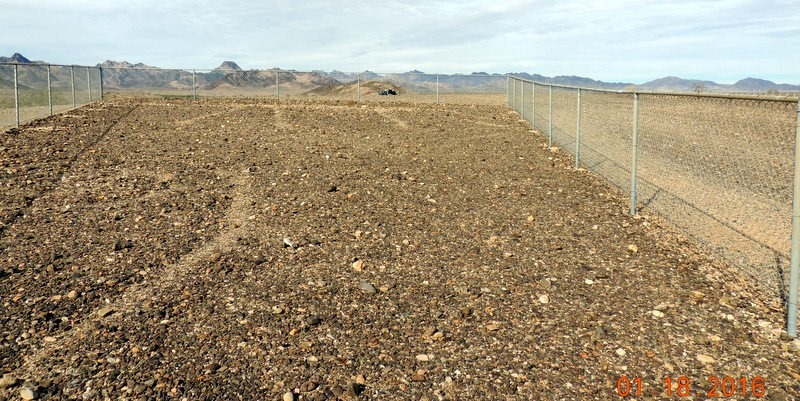 Tamped images can be very difficult to see and are best viewed in the early morning hours when the angle of light is low and the desert surface is not distorted by heat shimmers. The Blythe Intaglios are fascinating. 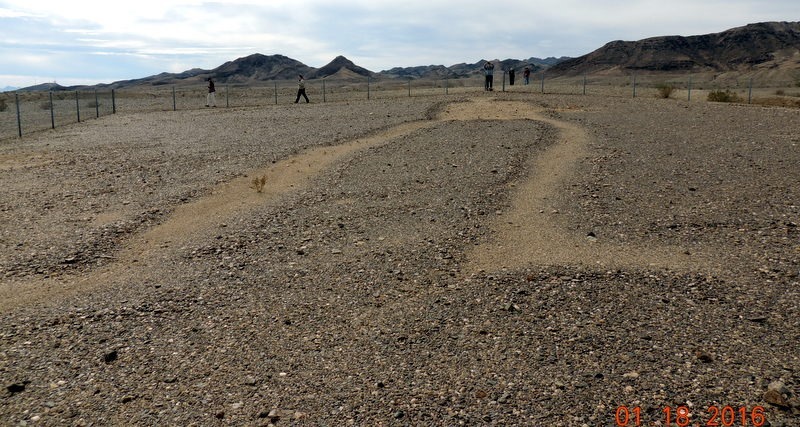 There are three that are left, and the National Park Service has fenced in the three areas. 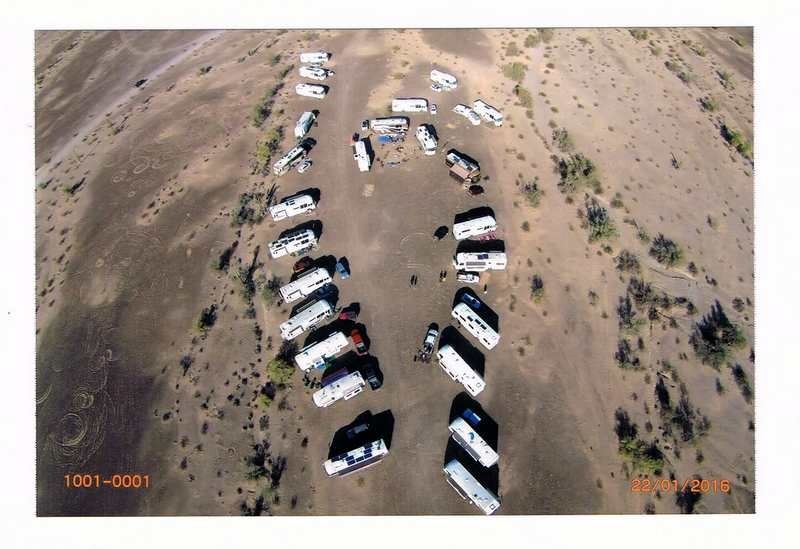 We parked all 10 vehicles, and walked out to look at the formations. We left and returned to Blythe, where we ate lunch at Rebel BBQ. They had a 4 star rating on Yelp and lived up their reviews. John and Deb bought us lunch for driving them. We returned to Quartzsite and stopped at The Gambler for some more table cloth holders. We were also looking for lights. Then we went to the Big White Tent, parking in the back since it was after 2. We stopped by Mike and Lorraine Lynch’s booth to introduce John and Deb to them, then we left them to shop, while I went to the Encore booth to make reservations for Florida. I was able to get reservations for 9 days at the Encore Everglades park, then a month at Sunshine Key, and finally at Ramblers Roost for 2 weeks over Christmas. The early bird cost was a lot less expensive than what we would pay, if we could even get a site, later! I stopped and bought a pair of “Dogs” sandals, and joined up with Bob and the Brewers. We returned to the MH in time for the social. Bob organized the BBQ dinner, which was a bring your own meat and cook it on the grills, along with pot luck sides and desserts. Again, we put out a call for grills and had around 6-7, with two of them very large arrived. Everyone had a good time. 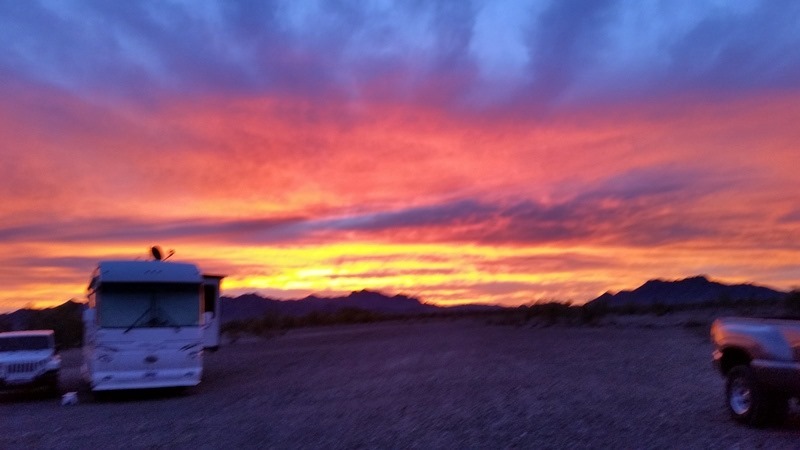 The sunsets are awesome and we sat out enjoying the campfire. Tuesday- I had asked yesterday for a volunteer to pick up doughnuts, and George Hall had gone to the bakery to pick up them up. I cleaned the table, and set up the OJ. Everyone swarmed the table for their morning doughnuts. We had the ‘coach walk’ at 10. It is always interesting to visit other coaches and to see the changes that other people have made. I liked John Kurtz window vents and we might look at them for our coach. I also liked Susan and Dale Prichard’s velcro on their trash cover, but I don’t think it would work for us. Everyone has made their coach their own! We worked around the MH, ate lunch, then went to Tyson Wells to the vendors. 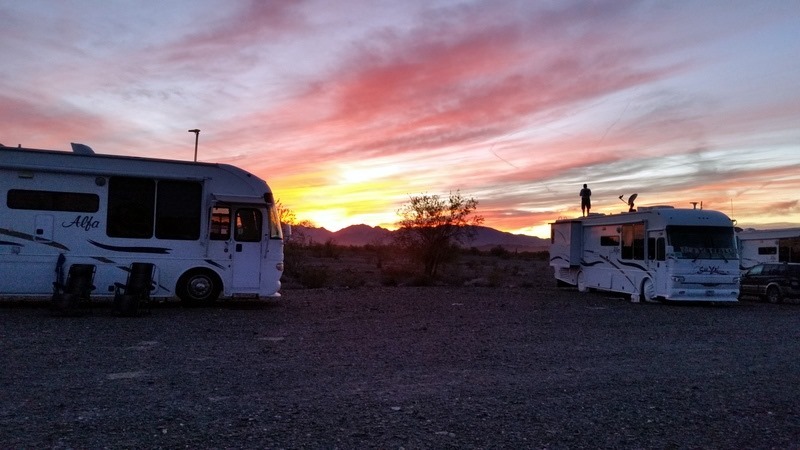 Quartzsite is amazing, there are so many vendors with all kinds of things you never knew you needed! I bought a new hat, we bought some other items, then returned to the campsite. Tonight it was heavy hor d’oeuvres. Again everyone swarmed the tables and had a great time sitting out. It was warmer this evening, and we sat out until tired. The sunset was beautiful again! Eventually it clouded up, then it started to sprinkle so everyone left. Of course, the clouds cleared, and the sky was full of stars. I went inside and made the casserole for breakfast in the morning. Wednesday- I did my usual morning straightening up, cleaned off the tables outside, and updated the board, while cooking the casserole. Meanwhile, Ray had come over to ask for Bob’s assistance. They had a very loud noise in the back of their MH. Ray and Bob thought it might be that a ‘critter’ had gotten in and was trying to get out. So they very carefully, opened the hatch on the back of the MH, jumping out of the way. Nope, nothing in there. Bob put his hand on the Electical Management System, and the noise stopped! It was pretty funny! At 8:30, everyone started arriving for the breakfast pot luck. Wow, did we have food! Potatoes, casseroles, bacon, sausage, sweet rolls, and lots of pancakes! We are definitely not starving in the desert! We sat around drinking coffee and chatting for awhile. After, I went to the MH and worked on the rally budget. We have a lot of money left over, so we are going to buy more doughnuts. I went over to MaryAnne’s rig and we talked it over and decided to have an ice cream social to use up more of the money. If we have too much leftover, we would have to return money to each person, which would be a pain in the neck. The difference in the rally this year was that I refused to do a lot of cooking. 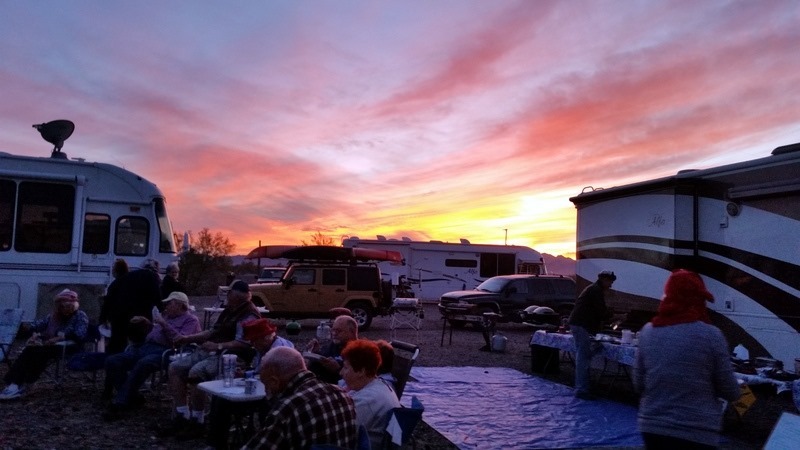 At the past rally’s, the Wagon Master cooked the welcome dinner. I think that cooking for 40+ people is way too much work. So when asked to be Wagon Master, I told them only if I did not have to cook. I was told that everything was at my discretion, so we set up the pizza dinner , pot luck dinners and a breakfast. 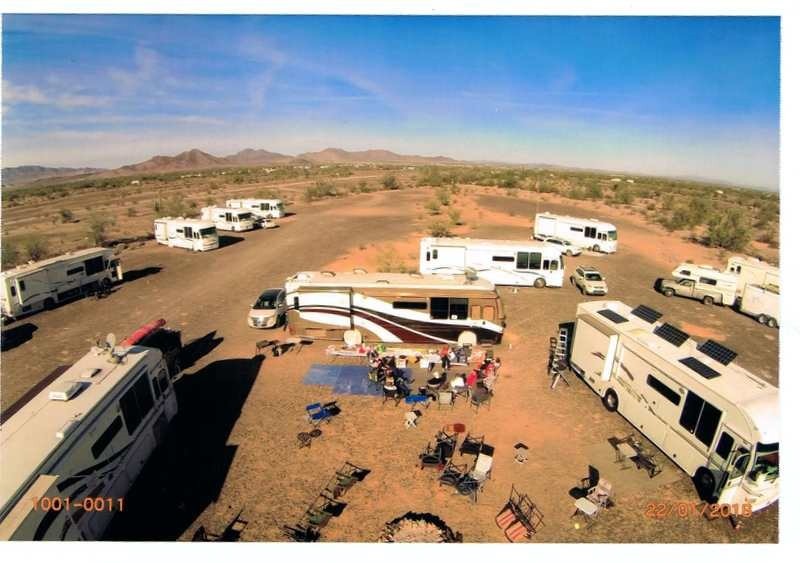 Also, we had in the past, a storage unit in Quartzsite for the grills, paper products, coffee pots etc. So two years ago, they board made a decision to get rid of the storage unit. So now people supply their own paper products, utensils, and coffee. Most people perked their own coffee anyway. So we have this savings and everyone seems to be enjoying the pot lucks. 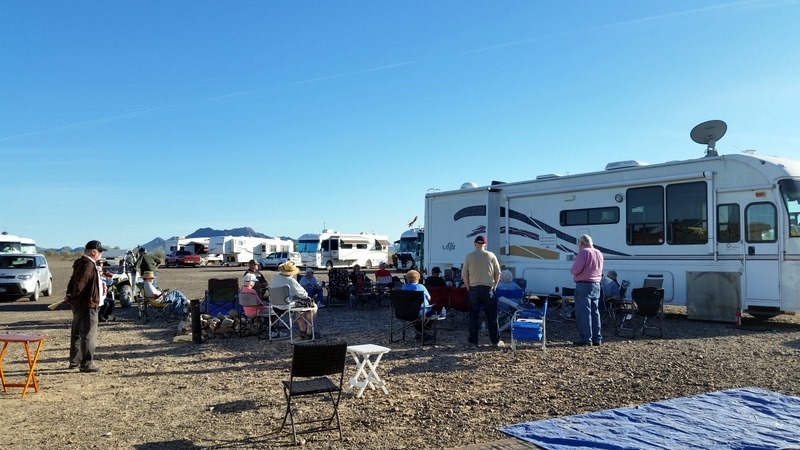 There was no Wagon Master last year, and they only had 13 rigs. This year, we are approaching 24 rigs, and may have some more coming in. MaryAnne and I ran into town to look for ice cream, the toppings and some charcoal briquettes for the potato bake on Friday evening. I did not realize that we needed the charcoal. We will pick up the ice cream tomorrow. Meanwhile, Bob has been working on finding out why our satellite was not working with the portable, but is working with the new satellite. He also checked a few maintenance items around the MH. After lunch, we took a too short nap! Then went to the Tech Talk at 3 PM. Taking tech is always a popular , as everyone wants to know about issues and solutions. Below is the tech talk. At about 4:30, we had social hour, then dinner at home today. We reheated the leftover breakfast casserole. Here was tonight’s sunset. The camera does not get all the awesome colors! We cooked s’mores over the campfire. As soon as it became dark, MaryAnne and Ray set up their telescope and we looked at the almost full moon. Around 9 we went back outside, but there was so much light from the moon, that seeing the stars just did not happen. We were able to see a slightly different view of the moon Through the telescope you can see the peaks and valleys on the moon, which is really cool! . Thursday- The Harris’s went to pick up the doughnuts for us today, so we were able to get other tasks completed. We ate breakfast and made sure that the doughnuts arrived. Then we went to do laundry at a local laundromat. The first one, which we have used before, was packed. So we went to another one. We did a lot of laundry! We stopped to pick up the ice cream ( 8 containers) on the way back and put it into the freezers. Then we At 1:45, we started setting up the ice cream social. Almost everyone showed up and there was only a little bit of the vanilla left, which we pitched. This was a popular event! No one was out at 4 for social hour, so we went out to join MaryAnne at 4:30. A few people showed up, but more arrived after dinner. 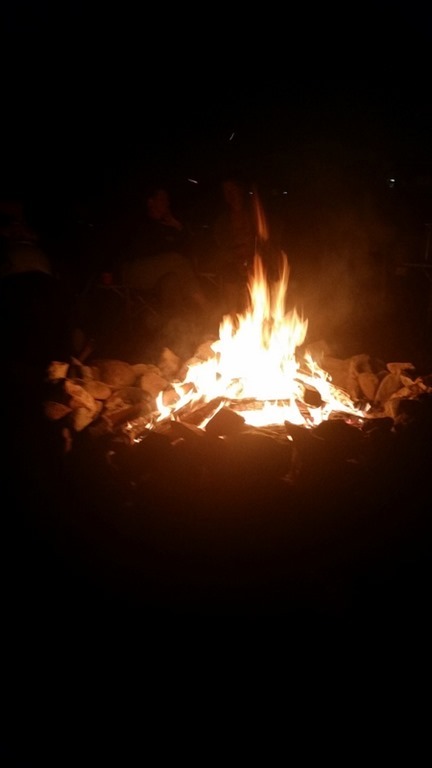 We had a nice campfire and greeted some new folks who showed up. One of the couples who arrived yesterday had run into this new couple at a Flying J and invited them to join us. We had s’mores again, but we have the ingredient left over. I am just going to put them out tomorrow afternoon. Friday- The temp was 41 degrees when we woke up. The skies had some high thin clouds, so it was going to be an other beautiful day! At 10 we had a craft display. Ladies brought items that they make and showed their skills. What talent! One lady showed a quilt that she is making for her grandson who graduates from college this year. In his school colors she did blocks, and in the center of each block, was a representation of his interests. It is beautiful. Another lady made baby blankets. There were so many interesting items. I showed my string art cards. So of the ladies took the patterns home to copy so that they could make them. While we were meeting, we looked up and Armand Mercier had his drone up, taking pictures of us. We ate lunch, then went to the Big Tent in the afternoon. We have learned the secret, go after lunch, when others are leaving and we can get a parking space. We had stopped at The Gambler, which is an RV parts store. Bob purchased a clip for one of the doors. He is going to move the Genie and the DVD player into a cabinet above the TV so that we do not have to move it all the time when traveling. At 4 we had social time. 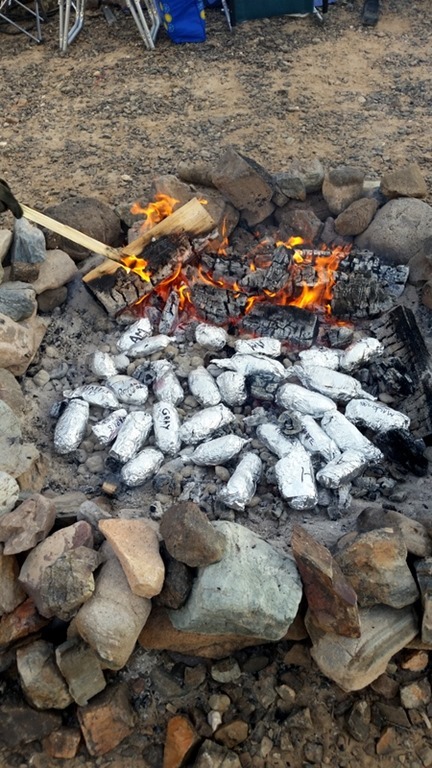 Ray started the campfire then added charcoals to the fire for cooking our potatoes. Tonight was baked potatoes for dinner. Everyone wrapped their potatoes in aluminum foil, then put their name on the potato. You put it into the coals and let the potato cook for 45 minutes. Everyone brought fixing for the potatoes and sides or desserts. We are definitely not going hungry in the desert! We had a campfire afterwards. Several Roadrunners joined us this evening for the dinner, even though they are not staying with us. We had a great time! The new couple who had just arrived had a lot of blisters and were from Maryland, so I went over to introduce myself to them. They are from La Plata! It’s a small world!!!! Their kids went to Star of the Sea and we were married there. We talked that gave them info on McMillers for the blister repair. We have had 26 rigs, with others in the area joining us. We have had over 60 people participating in this Rally! Awesome rally it seems. Yes Silly Al’s is an extremely popular Pizza place. Very hard to find d parking there. Glad you also enjoyed the Pizza. We are going to Cathedral City CA to stay at an RPI park, then to Alfateers in Fontana for a slide repair. Hopefully, it just needs to be aligned. Plan on east coast this summer and Florida next winter.